"In 1986, Harry Mason and his daughter, Cheryl, were driving to the resort town of Silent Hill for a vacation, when Harry swerves to avoid a figure in the road. Regaining consciousness after the crash to find Cheryl missing, he sets off in search of her on the streets of Silent Hill, which are deserted, foggy, and where snow is falling out of season. 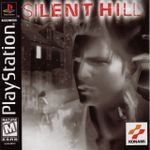 The goal of the game is to safely guide the player character, Harry Mason, through the dilapidated town of Silent Hill in search of his lost daughter, Cheryl. A major threat to Harry's survival are the hostile creatures wandering along the streets and inside buildings, and poor visibility means that Harry will almost always be surrounded by thick fog or darkness. The player will locate a pocket-size flashlight early in the game, but the light beam only illuminates for a few feet. For this reason, sound plays a large role in Silent Hill' gameplay, as the player will often be alerted to the noises enemies make, rather than the actual sight of them. As well as the flashlight, the player will also pick up a radio, which alerts Harry to the presence of creatures by emitting static when they are in proximity, allowing him to detect monsters before they can ambush him. Another obstacle to Harry's success is his own fragility; being an ordinary man with minimal experience in handling weapons, he cannot sustain many blows from enemies, and will gasp for breath when he has sprinted for a large distance." Source: Wikipedia, "Silent_Hill_(video_game)," available under the CC-BY-SA License.